Дългоoчакваното назначение е факт. Това е голямо улеснеие за всички нас! Правителството одобри председателя на Конфедерацията на работодателите и индустриалците в България (КРИБ) Иво Прокопиев за почетен консул на Канада в България.Това съобщи пресслужбата на кабинета след днешното заседание. Почетните консули се номинират от страната, която представляват, а кабинетът трябва да даде съгласие. Предложението е внесено от министъра на външните работи Николай Младенов. “Канада е много важна държава за България, съюзник, част от Г-8. С удоволствие приех поканата на канадското правителство да бъда почетен консул за България и ще работя активно за засилване на двустранните отношения”, коментира Иво Прокопиев. През ноември 2009 г. Министерският съвет прекрати правомощията на предишния почетен консул Левон Хампарцумян. Решението беше взето в отговор на постъпила от посолството на Канада в Букурещ вербална нота. Иво Прокопиев е съиздател на вестниците “Дневник” и “Капитал” и е основен акционер в “Алфа финанс холдинг”. Почетният консул работи на доброволни начала в помощ на гражданите на съответната държава, статутът му е регламентиран във Виенската конвенция. Работата на почетните консули не е толкова административна, а представителна. Докато консулите към посолствата се занимават например с издаването на визи, почетните консули имат за задача да поощряват икономическите взаимоотношения, да привличат чужди инвеститори и да популяризират културата на съответната страна, която представляват, организирайки напр. различни събития. Те не са държавни служители и не получават заплата. По регламент всеки почетен консул прави ежегоден отчет за дейността си пред външното министерство. За поста не се кандидатства и въпреки че формално Министерският съвет одобрява кандидатурата, изборът е изцяло в ръцете на държавата, чийто представител става кандидатът. Номинират се хора, които са добре познати, авторитетни и влиятелни личност в страната си. Необходимо е почетният консул да е финансово независим, тъй като не получава заплата, командировъчни или други финансови облаги. Определянето на почетни консули е много полезно в държави, в които изпращащата страна не поддържа представителство, но пък е необходимо да има канал за дипломатически контакти. Canadian household net worth hit $6 trillion in the first quarter of 2010. It increased by 1.3 per cent from $74 billion, and is the fourth consecutive quarterly improvement in household net worth. This means 96 per cent of net worth lost during the economic crash has been recovered, according to David Onyett-Jeffries, economist with RBC Economics, as reported on Muddy York's Toronto Real Estate blog. 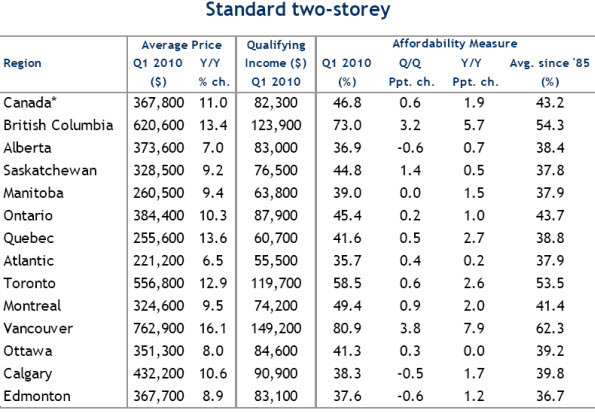 Other numbers from RBC show a strong Canadian housing market. Non-financial assets, where real estate contributes 85.5 per cent, is up 0.8 per cent to $24.9 billion from the previous quarter. Mortgage debt increased by $16.4 billion in the first quarter, signalling continued growth in the real estate market. Over all, household liabilities rose by 1.5 per cent to $1.4 trillion. CoolRent is proud to present Data-Tracker.net - a powerful marketing tool. It tracks changes to interest rates, exchange rates, sport results, etc. and posts them to your Facebook, blogger or wordpress blogs, or sends a personalized email to you, or your client. Data Tracker can publish just the changed data or can publish all rates after any change. RSS feed or third party services like ping.fm, can be used to transfer your email to all social networking services. Data-Tracker is intended to help mortgage broker to reach their clients and procpects and inform them of any changes to the interest rates. Using Data-Tracker.net to automatically publish on your Facebook and/or blog the latest changes of the interest rates will give your clients the opportunity to compare rates and trends and to be informed. Also your clients will receive a personalized email every time interest rates are changed and they can make adequate and inform decisions â€“ either to enter the market, or to wait, or perhaps convert from variable to fix rate. Having information of any changes to the interest rates (not just actual rates, but also any changes) and keeping your clients and prospects informed is priceless â€“ for anything else use Data-Tracker.net! You could probably find many ways to spend any “extra” cash that comes your way, whether it’s a tax refund, an unexpected gift, a bonus cheque, or just hard-earned savings. 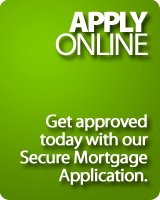 Consider using the money to prepay part of your mortgage. Even small prepayments can make a big impact over time and potentially save you thousands of dollars. The great benefit of making prepayments on your mortgage is that every extra dollar goes toward the principal amount of the loan. Since that’s the portion you pay interest on, paying it faster means paying less interest over the long term and becoming mortgage-free sooner. The higher your interest rate and the earlier you are in your amortization period, the greater your savings. But that’s not all. Prepaying your mortgage will help you build your home equity at a faster pace and will bring you one step closer to owning your home outright. There are three ways you can prepay your First National mortgage. To illustrate the savings potential, we’ll use the example of Joe, a new homeowner paying $830 a month in mortgage principal and interest. Joe’s mortgage is $150,000 at 4.5% and has an amortization period of 25 years. 1. Make an annual prepayment. You can pay up to 15% of your original principal each year on any of your regular payment dates, minimum $100. Savings potential: Joe receives a tax refund of $2,000 each year and decides to use it to make a principal payment on his mortgage at the end of every year. In this case, Joe could save approximately $28,000 in interest costs over the life of his mortgage and pay it off six years earlier. 2. Increase your payment amount. Once per year, you can increase your mortgage payment amount by up to 15%. The increased amount will go directly towards reducing your principal balance. Some exceptions apply, so check your mortgage documents. Savings potential: If you raise your mortgage payment amount in step with any increases in income, such as a raise, even a small amount can make a difference. By simply increasing his original monthly payments by $50, Joe could potentially save as much as $11,000 in interest costs. 3. Double-up a payment. You can double-up your payment on any regular payment date. This is applied directly to the principal of your mortgage. Savings potential: Joe decides to double-up on a single monthly mortgage payment each year, paying $1,660 instead of $830. If he did this every year for 10 years, he would save as much as $13,000 in interest and shave two years off his amortization. *Some conditions apply, subject to change without prior notice. Source: CMHC Housing Now - May 2010 and May 2009. This seasonally adjusted data goes through stages of revision at different times of the the year. Canadian resale home prices will be lower than previously predicted, according to revisions made by CREA to its 2010 forecast, due in large part to B.C. sales. "Lower expected activity in British Columbia accounts for more than half of the downward revision in national sales activity," the group said in a release. CREA cut its sales view to 490,600 units from their previous figure of 527,300. It also expects the average price to rise 1.6 per cent nationally in 2010, an almost four per cent drop from its previous forecast of 5.4 per cent. 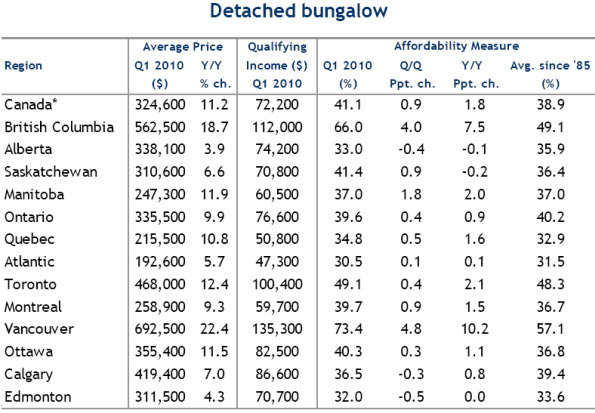 According to the industry group, the decline in affordability in B.C. hurt sales in the province during Q1, but added sales in Ontario were on point with their predictions. CREA now expects sales in B.C. to fall 5.9 per cent this year to 80,000 units. The superior practices of Canada's mortgage market should be imitated by the U.S., blogged Wall Street Journal mortgage and real estate reporter James R. Hagerty. At a U.S. housing-policy conference this week, Bank of Canada researcher Virginie Tract received "one of the biggest rounds of applause" by simply describing how the Canadian mortgage market works. She, however, declined to say if Canada does have a better system than the U.S, wrote Hagerty. - Canadian lenders are closely regulated and conservative, with subprime loans never accounting for more than 5 per cent of the market. - All Canadian mortgage loans give the lender recourse to the borrower's other assets, such as cars or savings, if the loan defaults. - In Canada, when a mortgage loan is more than 80 per cent of the property value, the borrower must buy mortgage insurance. Hagerty, after comparing these standards to U.S. practices, pointed out that "as of March, 0.44% of Canadian mortgage borrowers were three months or more past due on their loans. In the U.S., the rate was 9.5%." The New Housing Price Index rose 0.3 per cent in April following an identical increase in March, reported Statistics Canada today. Between March and April, prices increased the most in St. John's (+1.1%), followed by Regina and Saskatoon (both by +0.9%). Builders in these three areas said higher material and labour costs were key factors to the price increases. Charlottetown, and Greater Sudbury and Thunder Bay had the largest monthly decreases in April, as both areas' prices fell by 0.3 per cent. Builders from these two places reported they lowered prices to stay competitive. Vancouver registered the largest year-over-year increase by 6 per cent, followed by St. John's with 5.9 per cent and Winnipeg at 4.9 per cent. Pour bon nombre d’entre nous, l’achat d’une maison se finance au moyen d’un prêt. Le plus souvent, l’octroi du prêt dépendra de vos antécédents en matière de crédit. Bien que la majorité des gens sache qu’ils ont un rapport de solvabilité, plusieurs ignorent leur cote et le calcul de cette dernière. En cas de refus de votre demande de prêt ou si le prêt approuvé est inférieur à vos attentes, vous pouvez améliorer votre cote. Les cotes de crédit varient entre 350 (faible) et 850 (élevée), 680 étant la médiane. La cote prend en considération l’historique des paiements, les dettes actuelles, la période couverte par l’historique, le nombre et la fréquence des demandes de crédit et le type de crédit obtenu. Parmi les facteurs aggravant la cote Beacon ou Fico, on compte les paiements accusant un retard de plus de 30 jours (même de petits montants) et les cartes de crédit qui atteignent leur limite. Par ailleurs, l’historique détaillé fournit des renseignements personnels et bancaires, notamment sur les comptes et les paiements. 4) s’assurer que les renseignements personnels dans votre dossier de crédit sont exacts. Vous devriez consulter votre dossier de crédit chaque année. Aucuns frais ne seront exigés si la demande est présentée par la poste ou par télécopieur. En quoi le courtier hypothécaire peut-il vous être utile? Mettre de l’ordre dans vos finances constitue parfois une lourde tâche. Grâce à son expertise, le courtier hypothécaire peut évaluer votre situation de crédit et vous suggérer des façons de le rétablir. Avec vous, il travaillera à trouver la solution qui répond le mieux à votre situation particulière. Pour en connaître davantage sur la gestion du crédit, consultez le site web de Service Canada ou communiquez avec votre courtier hypothécaire sans tarder. First National à comme mandat d’offrir le meilleur service sur le marché !!! Ensemble nous pouvons réussir notre mandat. Merci pour le Support !!!! The Real Estate Market: What’s on the Horizon? If the recent number of new home listings is anything to go by, Canada’s real estate market is showing all the signs of a hot market. According to the Canadian Real Estate Association, there were 233,204 new listings in the first quarter of 2010 – more than any other first quarter period on record. Much of this activity is being propelled by the introduction of the HST in July, which will affect new homes with purchase prices above $400,000 in Ontario and $525,000 in B.C.. In addition, Nova Scotia will see an increase of two percent, bumping the province’s HST to 15 percent – the highest in Canada. Homeowners in B.C., Ontario and Nova Scotia are starting to list their properties during the robust spring market, in the hope of closing new home real estate transactions before the impending July 1 deadline. While this doesn’t impact homeowners outside of B.C., Ontario and Nova Scotia, that still represents a significant percentage of real estate transactions (even with the rebates offered on the first $400,000 of a new home purchase price). Those located outside of major urban centres will be largely unaffected, but new homeowners in major cities like Vancouver and Toronto will be deeply impacted, since the average purchase price for new homes is much higher. In addition to the HST, rising interest rates that are already affecting five-year fixed mortgages are prompting new home buyers to lock in now, before expected rate increases continue to play out over the coming 18 months. This is causing considerable turnover in the market, as homeowners accelerate plans to upgrade to larger homes before interest rates prohibit their ability to do so. While some forecasters are worried we might be in the midst of a mini-bubble, others suggest that the rising inventory on the market will help to normalize prices in hot markets. Once the HST comes into effect in July, the market should also begin to stabilize during the second half of 2010. Then again, real estate market trends have historically defied many conservative predictions, so expect some new twists and turns as this volatile market continues to evolve in the coming months. The potential impact on commercial real estate is of greater interest to small business owners, especially those in the manufacturing and retail sectors where the demand for significant commercial real estate is high. With the rise in interest rates, retail establishments can expect the cost of their tenancy to increase, as property owners get hit by commercial real estate mortgage rate hikes. In dense urban areas the demand for these choice real estate locations is also increasing, further driving up rent increases that are putting greater pressure on less established retail businesses. Even established retail operations are not immune to rate hikes, with many electing to make the risky move of relocating otherwise thriving businesses in sub-prime locations. So what’s the best approach for dealing with a highly volatile real estate landscape in 2010? Consider Your Total Exposure: Remember, as a small business owner, your level of risk in the housing market is directly tied to your stake in the commercial real estate market. Before making the decision to buy or sell both a home and a piece of commercial real estate, think about the long-term consequences of higher interest rates. You might be able to fund the impact on one of your properties, but not both. Don’t React to Short-term Fluctuations: As soon as rates start to rise, both homeowners and business owners start to panic. But the fact is, only a few times in the past 30 years have fixed-rate mortgages actually been more cost-effective to carry than a variable rate mortgage. As long as you’ve negotiated your variable rate mortgage to lock in at any time, there’s no need to panic when relatively minor rate increases take effect. Think About Other Ways to Reduce Commercial Real Estate Needs: If you’re feeling nervous about the market, consider other ways to run your business. For example, partnering with other companies to share office space can be highly economical. You might also consider remote working arrangements where employees leverage their home office instead of coming in every day. Also, more open office plans with shared work spaces might not be ideal, but you can significantly reduce the operating footprint of your business with some innovative planning. If the real estate market is leaving your business feeling vulnerable, you’re in good company. Whether now is the time to expand your business, sell your commercial holdings or lock in your commercial mortgage rate, take your cues from the market before you act. As Canadians recover from the recession, travel and consumer confidence is on the rise. According to Statistics Canada, "Canadian travel to the United States and overseas countries rose 3.6% in March from the previous month." In fact, 4.4 million outbound trips were taken by Canadians in March. Of those trips, 3.7 million were to the US, an increase from February. The largest increase was in overnight car trips, up 1.5%. As for overseas travel, Canadians took 690,000 trips in March, up 1.8% from February. A recent article in Travel Weekly states, "airlines, cruise lines, hotels and tourist boards are seeing figures that are well up on 2009 and are approaching 2008 levels." Although not as strong as 2008 numbers, travel is up more than anticipated. "The pace of improvement, based on an improving global economic situation, is much faster than anybody would have expected even six months ago," said Giovanni Bisignani, International Air Transport Association's director general and CEO. The Conference Board of Canada expects leisure trips to grow by 14% between 2009 and 2013. Without a comprehensive travel insurance plan, tourists are responsible for all medical expenses if an accident or illness occurs away from home. As well, they may lose all non-refundable prepaid travel fees if forced to cancel or interrupt their trip. Due to stern opposition from Canada and several other countries, the Group of 20 finance ministers dismissed plans for a global bank tax, giving individual nations more freedom to decide how banks will pay for any future bailouts. "By putting on a global tax, it would be treating the entire economy the same," said George Hugh, ING Direct's president of broker services and treasury. "Now they are saying there are differences between differenct countries, and leaving it up to them to come up with their own policies." Ending this past Saturday in Busan, Korea, the two-day meeting was held to review the progress on initiatives designed to make the financial systems safer after last year's global economic collapse. A bank tax, pushed for by the United States, Britain and France, would have levied all global financial institutions. All three countries spent billions of taxpayer dollars to save their biggest financial organizations. The money would have been placed in a fund as insurance in case of a future financial crisis, or sent to the general revenues of national governments. Canada Housing Trust, the financing branch of the nation's housing agency, may sell 15 per cent less debt this year, as higher interest rates and sales taxes slow the rate of mortgage purchases, reported Bloomberg Businessweek early this morning. The Housing Trust has issued C$13.9 billion so far this year in 5-year, 10-year and floating-rate notes, according to Canada Mortgage and Housing Corp. Based on those figures over the full year, the trust will probably sell less than C$40 billion. Last year, it sold a record $46.9 billion. "It reflects the expectation that the Canadian housing market is going to ease from where it is now," said Carlos Leitao, Laurentian Bank Securities Inc. chief economist, to Bloomberg Businessweek. "As interest rates come up a bit and the HST becomes a reality in Ontario and British Columbia, that alone would put the housing market on a slower track." Canada Housing Trust issues debt for CMHC, which then uses the proceeds to purchase packages of mortgage-backed securities from lenders. The seasonally adjusted annual rate of housing starts was reported as 189,100 units in May, according to Canada Mortgage and Housing Corporation, down from the revised 201,800 units in April. "Housing starts decreased in both the singles and the multiples segments in May," said Bob Dugan, chief economist at CMHC's market analysis centre. "The decrease in housing starts in May is consistent with our forecast that housing starts for 2010 will reach 182,000 units." The seasonally adjusted annual rate for urban starts decreased by 9.5 per cent to 165,200 units in May. Housing starts were previously expected to come in at an annualized rate of 205,000 for May. But the revised number is more in line with Canada's typical household-creation rate of 175,000 a year.